Why Top Option Demo Account? 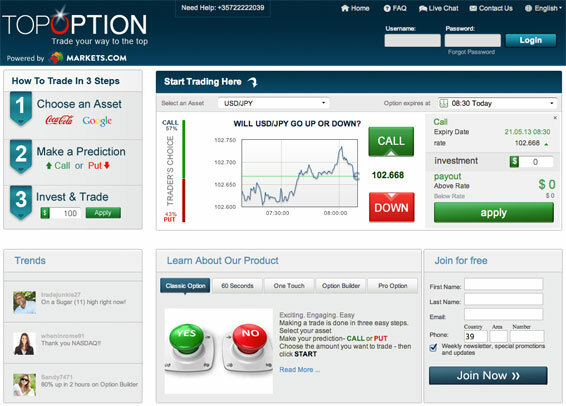 TopOption is a specialized Binary Options broker based in Europe which was founded in 2012 and has its headquarters located in Cyprus. Likewise, it also has satellite customer service offices in other countries like France and Spain. This broker belongs to the financial services company Safecap Investment Ltd., which owns major Forex brokers such as Markets.com and Finexo, and is registered and regulated by CySEC (Cyprus Securities Exchange Commission). With this regulation, TopOption offers customers greater certainty as to the legality and transparency of their services, and management of funds which get deposited, so they can start operating the Binary Options market. This is because brokers have to comply with common regulatory regimes for financial services in the European Union. Thus, TopOption becomes one of the many Binary Options brokers to be fully regulated. Regarding options that expire Out The Money, customers of this company have the ability to recover up to 10% of the amount invested in the option, which reduces the impact of losses on the investor’s trading account. When a client of TopOption invests $200 in a choice of the “Above/Below” type, he or she can make a profit of $140 to $170 if the option ends In The Money. However, if the option expires Out The Money because the trader was wrong forecasting the market, up to $20 can be recovered in this case. Opening a trading account with TopOption is possible by completing a simple form on the broker’s website. This is a quick and simple procedure which only takes a few minutes. Through this form you are required to supply basic data such as full name, an active email address and a phone number as a contact medium if necessary. Unlike other Binary Options brokers, investors should provide documents to prove their identity and place of residence as this is a requirement requested by CySEC. Once the account is activated, the client can start trading Binary Options as the necessary funds are deposited. The minimum deposit to start trading with TopOption is $100. The mediums accepted by this broker for its deposits and withdrawals are: bank transfer, credit cards, Moneybookers and Webmoney. Deposits can be made in USD and EUR. Starter: Designed for traders with little experience in the Binary Options market., this account requires a minimum deposit of $ 100 and offers distinct advantages, such as a welcome bonus of up to $250, an account manager, trading platforms based on web and mobile tools, risk management, a series of e-books on education, customer protection insurance, alerts and market updates. Pro: A type of trading account designed for customers with more experience in trading Binary Options. This type of account requires a minimum deposit of $1,000 and a welcome bonus of up to $500, a professional account manager, trading platforms based on web and mobile tools, risk management, a number of educational books, an electronic video library with personalized training (3 hours per month) and insurance consumer protection. VIP: This is a trading account created for clients with more experience and capital to invest in a professional manner in the Binary Options market. It requires a minimum deposit of $5,000 and offers distinct advantages such as a welcome bonus of up to $ 2,500, a specialist account manager, unlimited electronic video library with personalized training, insurance and consumer protection, and SMS messages for alerts and market updates.